Don’t Be Defeated! You Are A Winner! We are in the thick of our 30 Day challenge now! How are things going for you on your weight loss journey? Is everyone getting your workout in daily? I don’t know about you but this has been the toughest month for me thus far. I’m not going to make excuses but I am going to blame it on the weather change LOL! Just Kidding… This cold weather has made me want to stay in bed longer than normal when I should be out of the bed for my morning workout by 5am! However I made a decision that I’m not going to succumb to these cold temperatures nor any other obstacles that may come my way! I’m going to get up and fight! 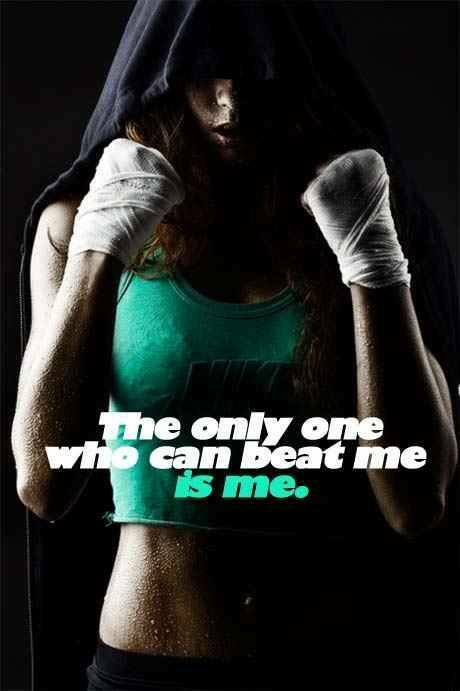 As this picture states no one can beat me but me. So I refuse to give up, give in, let go, or surrender! I have goals to meet and I will be victorious. What about you? What is your declaration today? Make sure it goes beyond a declaration, let it spring you forth into action. 30 Day Challenge – Day 11! Previous Post Don’t Let Anything Get You Off Track! Next Post Don’t quit! You can do this!